One of them literally! (See the one-of-a-kind Anna-ornament, just above the Christmas bears). And there's a glimpse of Zac to the side, who finds the tree so bright he has to wear shades :). Please also note the joint-effort creation of the now infamous star, which they decided should NOT be shiny, but white. They split up the work quite equitably--Zac finessed his way into "designing" the star by telling Anna she should do the decorating, since she's "so good at that." He'll make a fine delegator one day! 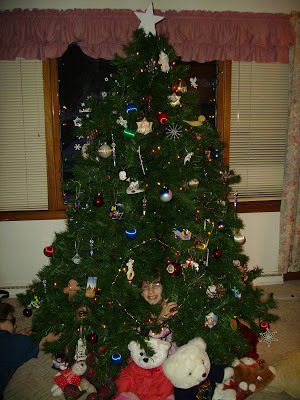 As for the rejected angel...when she was unpacked, Anna said maybe they should put her up next year--kids! Ah well, it's a tree with character...especially since I think the 2nd row and 3rd row of branches from the top got reversed, giving the tree that "trimmer" (pun intended!) waist many of us have on our Christmas wishlists! This year the baby Jesus in swaddling clothing will also grace our tree--he rests inside the jeweled halo now surrounding Anna, when he's not being called "Katie" and riding on Anna's hip. All was done while playing vintage 1960's Christmas carols on an actual record-player. (They sounded better once I changed the button from 45 to 33!). Very cute! They did a great job!